Body Transformation: Joe Zimecki Busted Barriers With Muscle! Joe refused to let an ileostomy bag control his life and proved that any fitness goal is reachable, even without a large intestine. See how he hit body fat goals and competed! I&apos;ve done lots of work in the fitness and supplement industry and was always asked why I didn&apos;t compete. If I didn&apos;t tell you, you would never know I live with an ileostomy bag, because I have no large intestine or gallbladder. Thich proves no obstacle should deter your fitness goals. My low point used to be going to the beach, pool, or taking my shirt off to cut grass at home. Not because I was extremely overweight, but because I didn&apos;t feel like answering questions about my ileostomy bag. We all have our insecurities. When I had surgery at age 31, my insecurity stuck around. I was young and recently married, which took a toll on me emotionally and physical. My turning point was last year at the beach when I didn&apos;t wear a shirt the entire vacation. I wore a shirt no matter the circumstances for nine years prior. Within 10 minutes of my shirt being off, a little girl asked, "What&apos;s that on your tummy?" I replied, "That&apos;s what happens when you don&apos;t eat your veggies." For a split second, I seriously thought about putting my shirt back on. 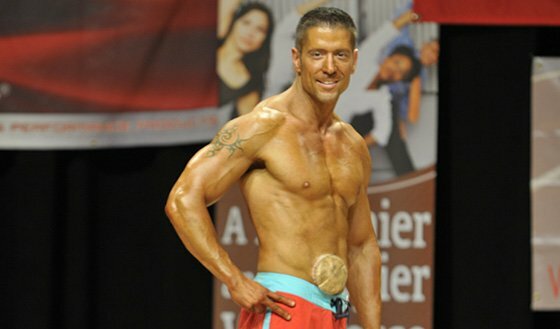 In December 2012, I started to research if anyone did a fitness show with an ileostomy. It took me nine years to take my shirt off at the beach and now I&apos;m going to get in the best shape of my life at age 41 with an ileostomy bag to be judged on my physique. My wife, Rachele, and our girls, Rayanna and Gia, knew if I dedicated myself to the process I would be successful. I talked to friends Emeka Okammor and Matthew Eubanks leading up to my decision and they were more excited about it than I. My family and extended family kept me focused and passionate about what I wanted to accomplish. For that, I&apos;m truly thankful. My life now is much healthier and I love how the transformation spilled into other areas of my life. I reach out to people afraid to ask for help and those with ostomies/ileostomies and work to inspire them with my progress. The backing from my family was crucial. It all starts at home. I joined fitness forums that connected me with like-minded people who were extremely helpful. I learned to live the lifestyle 100 percent to obtain the results I wanted. I followed this workout for 11 weeks with the addition of more cardio from week six until four days before my shows. The hardest challenge I faced was the timing and planning of food intake with ileostomy. Knowing your body and limits plays a key role in success. Working with my friend, Emeka Okammor, helped me understand the process. My plan allowed me to choose from multiple foods so I could pick safe options that fueled my body. I will continue to compete and take the personal training test. No matter your age or obstacles, you can overcome them to be successful. I also want to work with my ileostomy supply company, Coloplast, and educate others at conferences. It would be great to compete with my good friend Greg Bajsa, my medical consultant, and train with pro bodybuilder Cavino Johnson. "Believe in what you do to change your life and others." Set small timeframe goals in weeks, not months. Believe in what you do to change your life and others. Make food days in advance. Get everyone on board with your goal. Commit to the process and you&apos;ll be successful. The aspect of Bodybuilding.com that helped me most was the articles. There are several awesome workouts, great supplement advice, and tools to track your progress on BodySpace.